The fourth generation Audi A8 is an exquisite sedan that befits its flagship status. 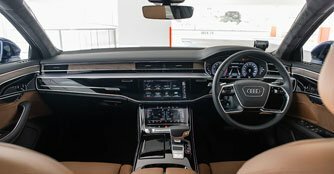 It seems Audi has fully and positively embraced technology with its fourth generation A8 flagship sedan. It's so advanced and tech savvy that you'll almost never feel alone... even when you're driving back home from the office on your own. Why, you may ask? Well, that's because - like Siri - the A8 responds to your requests and questions like any humble assistant would. Like Alfred to Bruce Wayne? For instance, you can mention that you're feeling hot and the car will drop the air-con temperature for you. Say, if you're keen to make plans with the missus the next day but want to make sure the weather is perfect, just ask what the weather will be like tomorrow and, voila, it's settled. Such is the execution of Audi, where it strives to up the tech ante of its cars - in this case the A8 flagship sedan. Of course, it doesn't just end with having a chat with the car, as ridiculous as it sounds. The fourth generation A8 features a 10.1-inch haptic feedback touchscreen that recognises inputs with a mechanical pulse when tapped. Located just below is another screen which houses your air-conditioning functions and other operations such as navigation searches via handwriting recognition. But don't let the dual-screen setup scare you. 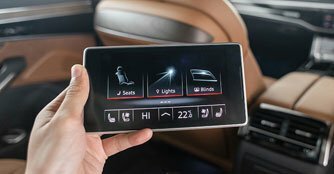 While it takes a while to get used to, like most high-technology devices, the system in the A8 is highly configurable. It allows you to choose and display your dedicated buttons (like the ones you will mostly use such as radio, telephone, etc), and has a response that's immediate. Thanks to this setup, almost every knob and button have been removed, making the cockpit of the A8 clean and simple. The only lone knob that remains is the one that controls the volume of your infotainment system. But that's not the only physical control in the car. A removable tablet at the rear also allows your rear passengers to access numerous cabin functions as well as infotainment features. Can it drive as well as its tech? Thankfully, Audi hasn't just focused on technology alone with the A8. Just as remarkable as its tech is the way the car drives. There's a strong sense of certainty in the way it tackles corners despite its immense proportions. 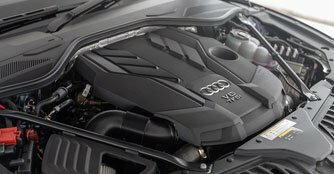 At over five metres long and close to two metres wide, the A8 doesn't disappoint with its taut chassis and dynamic handling. Admittedly, it isn't the easiest car to place on narrow roads but the smooth and comfortable ride quality does extremely well to defy its mass. And if it's parking you're worried about, the 360-degree camera will do its job well to guide you. But for a car like the A8 limo, it isn't so much about the 340bhp and 500Nm of torque produced by the 3.0-litre V6 turbocharged powerplant. Neither is it about the 48V mild hybrid system that supports coasting with engine switched off and high recuperation output of up to 12kW. Instead, it's the high levels of refinement that should be seriously considered, more so since the car will set you back $437,479 (as of 11 September 2018). In this case, the new Audi scores well. Power delivery is creamy and linear, with the eight-speed gearbox changing cogs promptly and accurately. Squeeze the gas pedal and you'll find the car swallowing up the tarmac in an instant. Century sprint is completed in just 5.7 seconds, a respectable figure for a car that weighs over two tonnes. 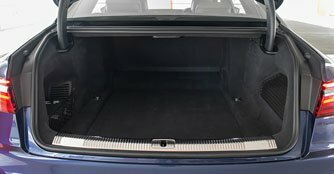 Even as you exceed the speed limit on the highway, which is an easy thing to do with this car, the well-insulated cabin isolates occupants from external noises. There's hardly any vibration inside the car, too. The A8's ability to float over road irregularities doesn't fail to astonish even the most demanding passenger. 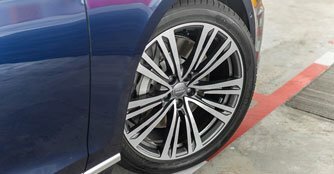 On this note, the Audi rises to its rivals like the BMW 7 Series, the Lexus LS, the Jaguar XJ and the Mercedes-Benz S-Class. So it's up there with the rest of the flagship pack? For the first time in a very long time, Audi is posing a serious threat to its strong peers from BMW and Mercedes-Benz with its A8. From its exquisite and minimalistic cabin to the contemporary and handsome exterior design - this car is anything but generic. More relevantly, the German marque has done well to prove that it's right up there with the best when it comes to technological innovation. And it sure as hell wouldn't lose out to its fellow rivals when it comes to cabin quality and driving capability. Audi A6 Avant $1,087/m what's the catch?